Writing Great Content for SEO - Who Is User X? Writing Great Content for SEO - Who Is User X? Let’s face it. Content is still king. You have to write great content for SEO. There’s no other way around it and Google has proven that there’s no way to trick your way to the top. So what are you supposed to do? How do you compete with companies that have teams of writers? The easy answer is you don’t. Honestly, who cares if you’re ranking higher than larger companies. Do they sell your product? Do they know what you know? Yes? Then maybe you’re selling the wrong product or service. Maybe you should go work for one of those larger companies. But if you’re selling a unique product or service you should be targeting folks that are looking for your unique product or service. Let’s say that you are selling a widget. This is the next great widget and you want to write about it so people searching for “widget” will find your post. The key is keyword density. This means you have to have your keyword or phrase integrated heavily in every part of your post. Look at this example of a post targeting “widgets”. H2 – Widgets are great for doing this! H2 – Widgets are also good for that! Within body copy – the word “widgets” is found 15 times. A link is visible at all times while scrolling down the page. has “widgets” in the alt tag. 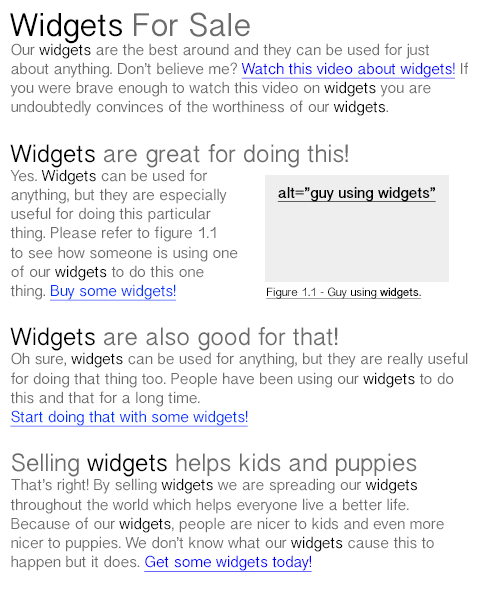 Has “widgets” in the title tag. I said it before, but it’s worth saying again. You don’t need the MOST traffic. You need TARGETED traffic. Focus on what you’re trying to sell. Write about that thing, give the visitors somewhere to go, and reap the rewards of great content!